﻿ Produce 3mm Round With Flange Type Infrared LED , Export 38KHz Infeared led Remote-Control Receiver Module, Supply 3mm Round With Flange Type Infrared LED suppliers, OEM 38KHz Infeared led Remote-Control Receiver Module. ◇ Photo detector and preamplifier in one package High photo sensitivity. ◇ Improved inner shielding against electrical field disturbance. ◇ Suitable burst length≧10 cycles/burst. ◇ TTL and CMOS compatibility. ◇ Improved immunity against ambient light. ◇ Internal filter for PCM frequency. 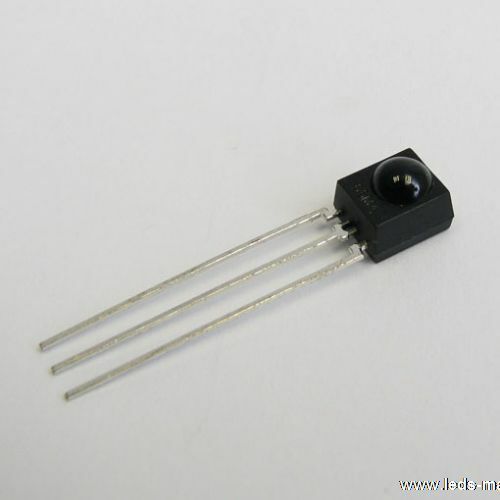 ◇ Bi-CMOS manufacture IC; ESD HBM>4000V; MM>250V. speed PIN phototransistor and the full wave band preamplifier. designed as an IR filter. ◇ The demodulated output signal can directly be decoded by a microprocessor. ◇ Light detecting portion of remote control. ◇ AV instruments such as Audio, TV, VCR, CD, MD, etc. ◇ CATV set top boxes. ◇ The other equipments with wireless remote control. ◇ Home appliances such as Air-conditioner, Fan, etc.